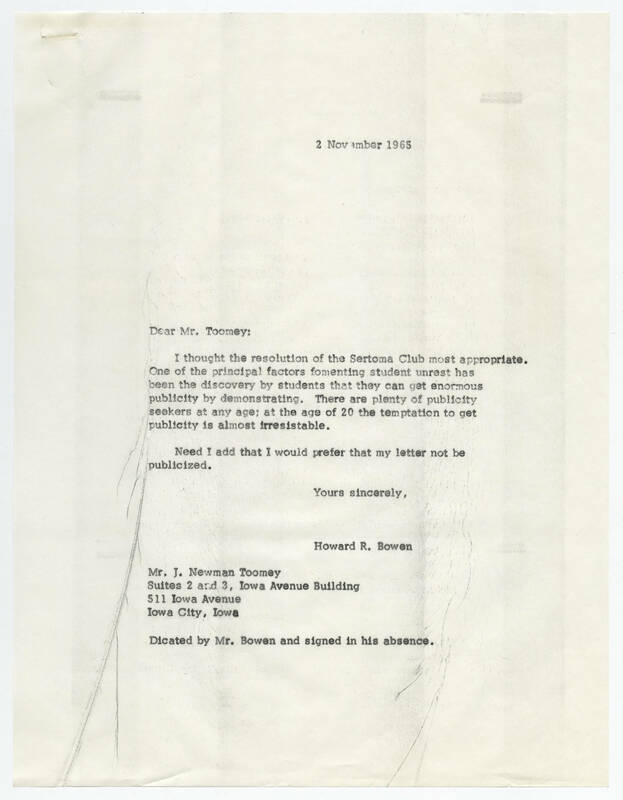 2 November 1965 Dear Mr. Toomey: I thought the resolution of the Sertoma Club most appropriate. One of the principal factors fomenting student unrest has been the discovery by students that they can get enormous publicity by demonstrating. There are plenty of publicity seekers at any age; at the age of 20 the temptation to get publicity is almost irresistable. Need I add that I would prefer that my letter not be publicized. Yours sincerely, Howard R. Bowen Mr. J. Newman Toomey Suites 2 and 3, Iowa Avenue Building 511 Iowa Avenue Iowa City, Iowa Dictated by Mr. Bowen and signed in his absence.